As was the case last year, Four Year Strong have new music out for the Summer, and I’ve come to find that there’s rarely a better time to listen to the Massachusetts four piece. 2014’s Go Down In History was an EP well catered for the season, and its following self-titled release picks up where it left off – upbeat, rife with hooks and generally as feel-good as a loud, riff-filled pop-punk release can be. If you choose to read any other reviews of Four Year Strong, which you probably should, you’ll likely find that most will highlight the bands 2011 effort In Some Way, Shape Or Form as a means to talk about how much better the band’s latest effort is. Last year Four Year Strong bounced back from that polarising LP by returning to the sound which didn’t feature on In Some Way…, and as a result they sounded rejuvenated and reinvigorated. That trend continues this time around, and that’ll be good news for all fans uncertain as to how Four Year Strong would proceed after releasing their weakest record by some distance and then subsequently disappearing. Four Year Strong trumps In Some Way… in all ways, and at times the records biggest strength is that it isn’t similar to the bands lacklustre fourth LP. Since its release I’d say that I’ve listened to In Some Way… maybe three or four times in its entirety, a number which pales in comparison to the times I’ve spun Enemy Of The World, and even Rise Or Die Trying. At the time of writing this I’ve ran through the band’s latest eponymous release ten times, and that isn’t just because I wanted to review it. Four Year Strong is, well, Four Year Strong, at least it’s the Four Year Strong I knew before I was sorely disappointed by In Some Way… The record continues the return to form that Go Down In History established last year, and for the most part it’s what fans will want to hear from the bearded Worcester natives. That’s the selling point, that’s the reason to pick it up; Four Year Strong are back, and you’ll probably want to reacquaint yourself. Even if that’s the only reason to give it a chance, it’s still a pretty solid reason. ‘When it’s gone, it’s never gone for too long’ lead vocalists Alan Day and Dan O’Connor sing on Wipe Yourself Off Man. You Dead. So it would seem. I didn’t like In Some Way… as you’ve probably gathered, but I like Four Year Strong, maybe if not as much as I wanted to going into it. Back in 2011 I wanted Enemy Of The World Pt.2 and got its boring older brother instead, and now I have what I was looking for originally, with artwork better than I could have ever anticipated. Several songs borrow their name from popular culture; the choruses are huge; the riffs are expertly done; the dual vocals work and encourage participation. This feels like the Four Year Strong I knew, and listening to album highlights Stolen Credit Card! and We All Float Down Here (kudos for the It reference) I’m very happy about it, and the record as a collective body feels more like an eventual continuation than a total reboot, as if In Some Way… never happened. The production of Converge’s Kurt Ballou has a tendency to favour highlighting the bass drums, and although a distraction at first it soon grows on you, diminishing from some other elements of the songs but working for the most part, the aforementioned Stolen Credit Card! particularly benefitting during one of the finer choruses. Towards the midpoint things lose steam if only briefly,but for the most part it’s plain sailing, the record is easy to enjoy and sometimes that’s all you really want from a Four Year Strong record; a release made for sunny days with friends. There’s elements of easycore to Gravity, and the sub-genre has always aimed for this setting. In the same way that Wasting Time (Eternal Summer) had me waiting for clouds to pass, The Sound Of Your Heart does the same, and it’s clear that even after a lapse Four Year Strong can still write a song catered to warm afternoons, even if it doesn’t always do enough to make sure it sticks around into the night. Here’s where a 9/10 review shifts towards a still agreeable 7/10. 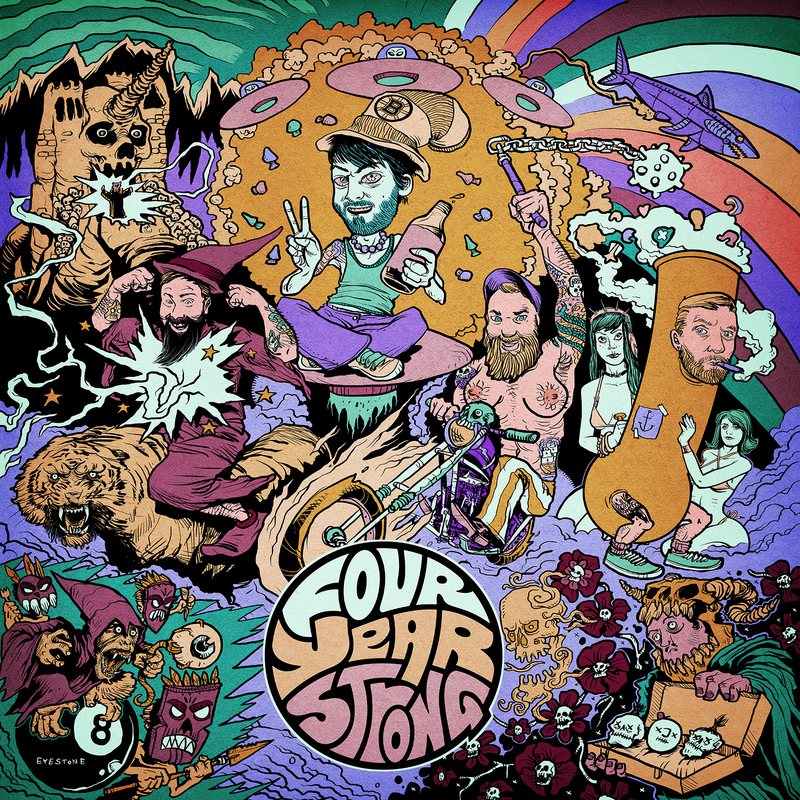 Four Year Strong, for all of its strengths, has its issues, and the first I’ll address is that it ends on a fairly underwhelming note with the title track of last year’s EP, underwhelming at least if you’re heard said release, which I have plenty of times. Although Go Down With History is a very strong song, with a chorus remaining infectious and anthemic, it feels like a flat closer given that it’s been readily available for a while now. Albeit a small criticism it’s a criticism nonetheless, even though the song remains one of the best from a second half which does drag on occasion. The issue, moreso with the track than the album, is that it’s too familiar, and the record as a whole doesn’t deviate enough from the material preceding In Some Way… That may sound strange given how complementary I was of the return to the norm, but there were times on Four Year Strong where I felt like I was retracing my steps even though the songs were new. It makes tracks such as I’m A Big Bright Shining Star and Here’s To Swimming With Bow Legged Women blend a little too easily into the bands discography, and although solid individually they didn’t stand out as much as they should. I know that I can’t have it both ways, and its selfish to want new material which sounds like old material but not too much so, especially after lamenting the band for straying from their roots earlier, but that’s very much how I feel about Four Year Strong. There’s not a whole lot wrong with this record, very little in fact, but I can’t seem to move past this stumbling block, and that’s made me look somewhat negatively on a record which deserves credit for knowing what the listener wants, and knows how to deliver it with tenacity and craft. It’s a weird one admittedly, and I’m still not sure how to resolve my own conflicts in regard to the self-inflicted dilemma. Maybe I’ll work it out, but in the meantime you can check out Four Year Strong for yourself here, link permitting.